City of Hope includes both a medical center, with acute and ambulatory care, and a research institute focused on basic biosciences research. The Lee Graff Medical & Scientific Library serves the entire institution but until recently had devoted a majority of resources to supporting research rather than clinical care. Through surveys and interviews with constituents, library staff determined that Medical Center staff had many unmet information needs. A retirement opened a position that could be reconfigured to support evidence-based practice and be somewhat embedded in the clinical environment—a clinical librarian. To lay the groundwork for a successful clinical librarian program by involving stakeholders from the very beginning, so that clinical needs could be addressed quickly and appropriately. The library director identified key stakeholders, explained the concept of a clinical librarian, asked for (and received) their support, and involved them in each step of the recruitment. Clinicians in various roles provided feedback on the position description. The search committee was comprised of mostly clinicians who screened applicants, recruited colleagues to participate in interviews, and ranked candidates. All candidates were asked to give a presentation on their vision for a clinical librarian program. These presentations further educated the stakeholders and built enthusiasm for the program. The new recruit was able to make contact quickly with many of the stakeholders involved in the search, most of whom she had already met during her interview. So the new clinical librarian was able to become effective quickly, participating in committees and starting projects in her very first week. Like a garden, a successful library program begins with good preparation. If you sow the seeds in carefully prepared soil, they will sprout and grow quickly into strong, successful programs that will bear much fruit. 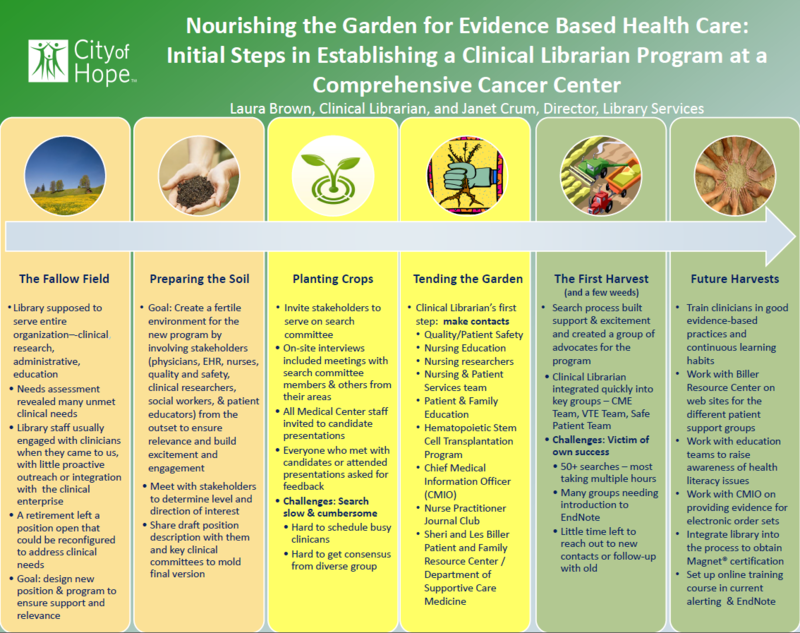 What a beautiful metaphor (the poster) and method (the process) for creating and supporting a clinical librarian position that focuses on evidence-based practice. I hope it is implemented widely across the profession. Nicely done! Hi Laura and Janet– I love the design of this poster! It really shows the stages of the process well. You mention that your efforts paid off a little too well– the librarian was swamped with searches and work– and you want to educate more clinicians to do their own searches. I’m wondering how you managed to change expectations about the clinical librarian’s role in this search process. Do you have any tips to share? I am not as worried about educating clinicians to do their own searches. I believe it is better and more economical for me to do specific need searches. The educational role I am intending to pursue is is how to use the informational tools available to have their routine, keeping up with the evidence, automatically feed to them in a way that they can easily keep it organized and us it in their clinical practice. Thanks, Laura! I like the analogy of acute versus routine searches. So the goal is to get them up to basic speed for daily needs, then you and the other librarians are there for specific needs.